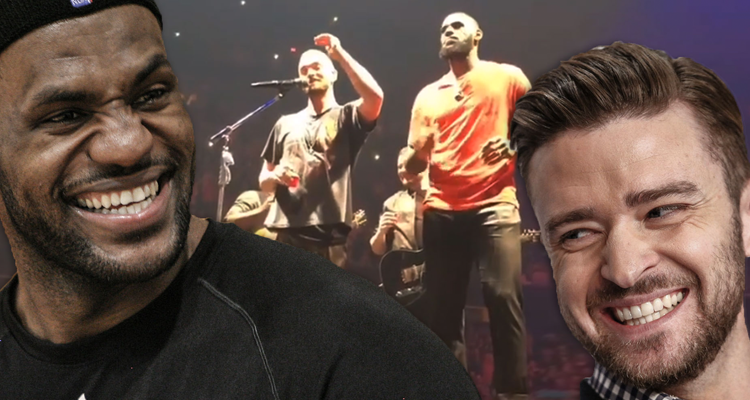 Justin Timberlake invited a very special guest out on stage during his Saturday night performance at Cleveland’s Quicken Loans Arena: LeBron James. This happened after Timberlake watched King James lead his Cavs to victory against the New Orleans Pelicans on Friday. The two had a friendly (but secret conversation) on the court, hiding their convo with their shirts over their mouths. My guy @justintimberlake and I talking about how……… Y’all wish I told y’all what we were talking about don’t you?!?! Nope. #FamilyTies Circle got smaller, everybody can’t Go! Thanks JT for coming to the show last night and it’s only right I come pay it back tonight when u show out! Let’s work! After the encounter, LeBron got on social media and promised to come see JT perform at the Cavs’ home turf that evening. Sure enough, he delivered, arriving with shots for everyone on stage. After she short appearance on stage and a huge round of applause for the basketball star, he then left so Timberlake could continue his performance. A MOMENT. Had no idea @kingjames was jumping on stage tonight. Thanks for celebrating with us, Cleveland…cheers!